The good news is that you can play safe by choosing products that are free of potentially harmful chemicals - but first you'll have to learn to translate those unpronounceable names. Used to preserve fragrance in shampoos, conditioners, lotions and other body-care products, this chemical is also used in plastic baby bottles. 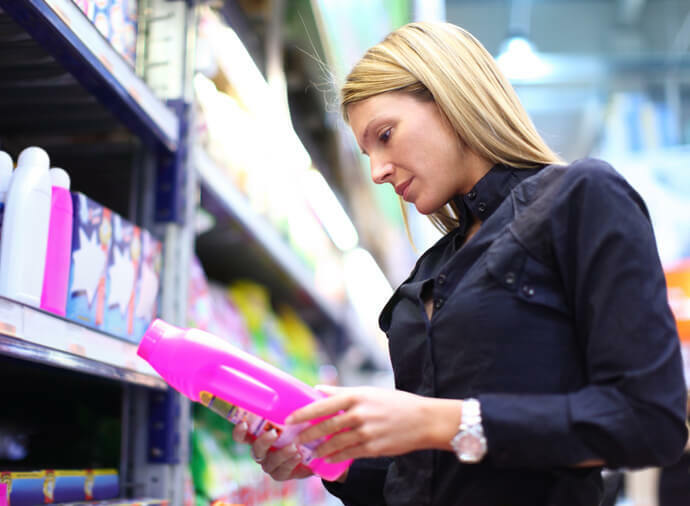 Studies have shown that phthalates could cause reproductive birth defects in animals. While their use in baby bottles is being phased out (slowly), they are still used in a range of baby-care products. An irritant that causes a skin rashes, this chemical has been found (through animal and other studies) to cause deafness, kidney damage and liver problems after long-term exposure. This skin irritant’s effects include redness, itching and pain. Used in many shampoos, this chemical releases formaldehyde into the product to help prevent natural ingredients from molding or spoiling. It can cause dermatitis (eczema) and may be linked to cancer. Talc is a common ingredient in the most popular baby powders. Inhaling it can cause babies respiratory problems, some potentially fatal. Use lotions and soap products sparingly. Usually water and mild soap work just fine at keeping your baby clean - and safe. Use everyday items you probably have in your kitchen to make your own baby skincare products. For ideas and recipes, visit www.babiesonline.com or www.wholesomebabyfood.com. Look for baby wipes with aloe; usually they don't have propylene glycol. Or make your own. Avoid products that have fragrance listed in their ingredients. Babies don't need it anyway. Keep in mind that there are no regulations for the labeling of body care products, including those for babies, so do your research. To look up specific brands, check out www.cosmeticsdatabase.com. Many natural products are free of these and other harmful chemicals, but you can't count on it. Recently, some companies claiming to sell “organic” and “natural” products have been sued after they were found to contain ethylene oxide and its byproduct 1,4-dioxane, both of which can cause cancer. Their presence is a result of using chemicals made from petroleum (petrochemicals) to create shampoo, soap and other body-care products. In addition to the risk it poses to your baby, 1,4-dioxane can also contaminate ground water. ceteareth-20 (also known as PEG-20 cetostearyl alcohol, stearyl ether and polyethylene glycol 1000 cetyl).